Yudel Noar married Ita bat Leizer-Chackel. Ita died in 4/27/1905 at the age of 54. 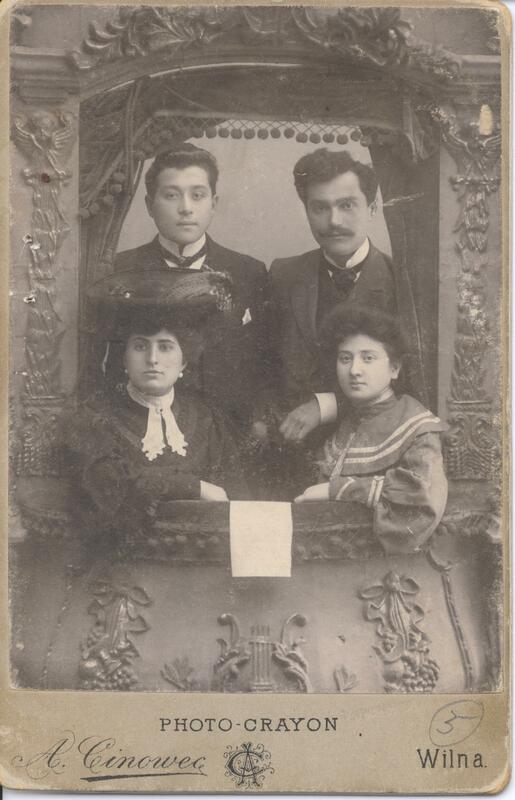 Yudel was remarried to the widow Pesa bat Leizer Terk on May 14, 1906. Yudel was 60 years old and Pesa was 47. He died in 1909 at the age of 63. Yudel had many children, all with his first wife Ita. According to birth records for his children, Yudel was a resident of Vilna until the late 1880's. Some time between 1886 and 1890 he became a resident of Ciobiskis, Russia (now Lithuania). By 1905 he moved back to Vilna and purchased 2 properties in what is now Vilnius, Lith. The family lived in one property, which was residential, #18 Spitalna St. The other property (#12 Yatkova St) was business/residential with stores in the front of the 1st floor and rental units above and behind. Looking at the Yatkova Ln side of #18 Spitalnia St with Spitalna leading off in the distance. It was rebuilt according to the original plans. Buildings surrounding the courtyard of #18 Spitalna St.
Isaac (28) married Roza bat Shneer-Zelman Czernusski (22) on Sept. 4, 1902. They had 3 children, Tatyana (b 12/31/1903), Leon (b 1/28/1905), and Yuli (b 7/6/1909). He operated a wholesale/retail cotton textiles store with his brother Hillel at 12 Yatkova St. In 1915 they lived at #19 Little Stefanovskaya St. Isaac's family was killed in the Vilna Ghetto by the Nazis and Lithuanians. When he was 16, Joseph moved to America (NY City). He was later married to Clara and died, in 1946, without children. In 1922 he lived in Brooklyn and 1925 at 123 Second Ave. in NY. Joseph opened a diamond store called The Manhattan Diamond Exchange at 61 Eldridge St. At least two relatives bought diamond engagement rings at his store. One was a son of his uncle Solomon (Abraham andBelle) and the other was a son of his brother Leizer (Abraham and Annie). Belle Noar told how she and fiancé Abe Noar "went to Abe's cousin who had a diamond business in NY to get an engagement ring. This cousin said, ''Abe, don't worry, I'll make your girl a beautiful ring' and it was beautiful." 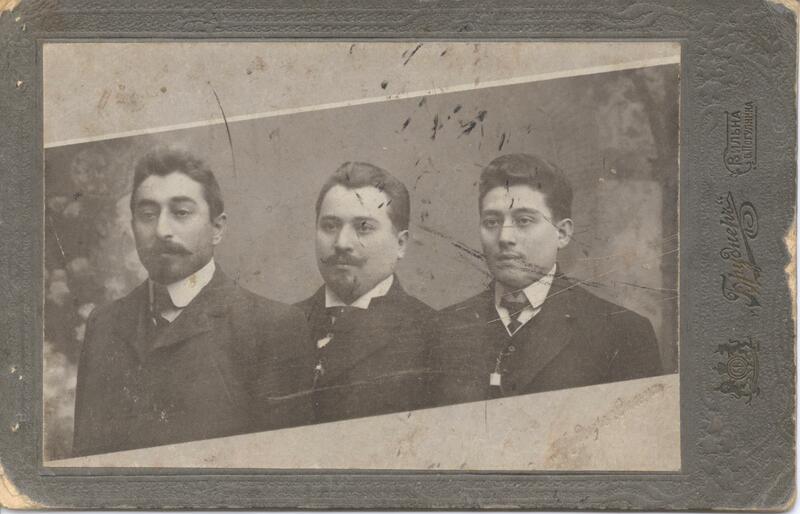 When Joseph was naturalized in 1902, his uncle Solomon is listed as the witness. Leizer was a cantor in Oshmiany, Poland and was in the flour business, selling flour to the bakers. They lived in a little brick building. The family from Vilna used to come visit Leizer and his family in Oshmiany for vacation. He was married to Sheina Toiba Palestine and had 4 children: Rachel, Zalman, Abraham H., and Julius. In 1919, during a pogram, Toiba and Rachel were murdered by Russian soldiers. He then moved back to Vilna with Zalman, Abraham H., and Julius. The family made some room for them in a storeroom in #12 Yatkova. When a rental unit came available, in the 2nd floor of that building, Leizer moved in with his remaining sons. To support himself, he opened a haberdashery store in the building. The 1923 Vilna Business Directory lists him as having a registered business of Handkerchiefs and Shawls at #12 Yatkova St.
Leizer and Zalman were killed in the Vilna Ghetto by the Nazis and Lithuanians. 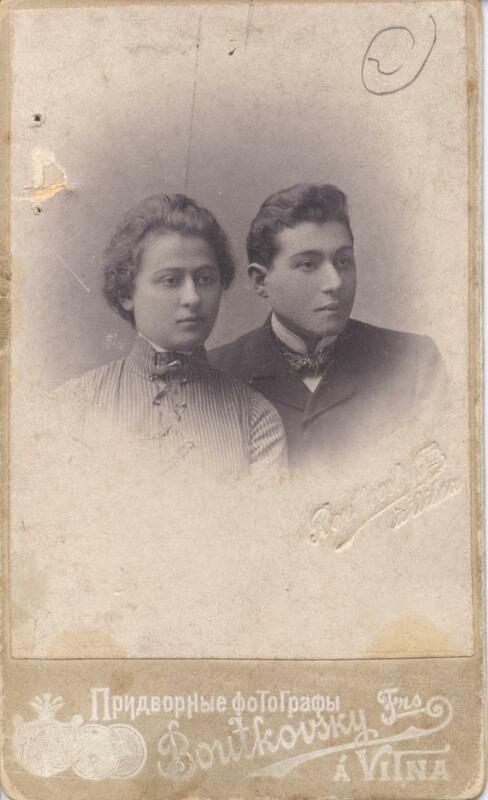 Hillel (25) married Dvora bat Eliash-Yankel Daikhes (24) on Dec. 10, 1908. 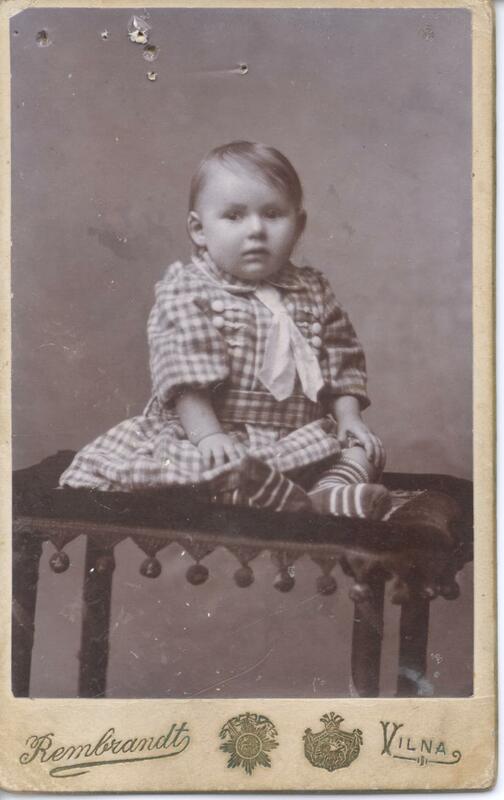 They had 2 children, Ita (b 2/1/1911) and Yuli (b 6/9/1913). He operated a cotton textiles store with his brother Isaac at #12 Yatkova St. In 1915 they were living at #18 Spitalna St. Hillel's family was killed in the Vilna Ghetto by the Nazis and Lithuanians. the war and died in the Vilna ghetto. The fact that Liba is a hospital orderly was instrumental in their still being alive in the ghetto in 1942 (see Vilna Ghetto). According to the age given, Julius was Hillel's son. business, one set of bribes, but two independent businesses. Moisey was born to Yudel and Ita on 8/30/1890. No other information is available at this time. Maria married Genrick Waldenberg and lived in Leningrad (St. Petersburg), Russia. She became ill and died in December, 1928. Tchernia was born in 1884. Her married name was Pomeranz and had a daughter Ida. Tchernia and Ida were killed in the Vilna Ghetto by the Nazis and Lithuanians. Grigory - Died around 1925 in what was Vilna, Poland (now Vilnius, Lithuania). Shena was born in 1886. 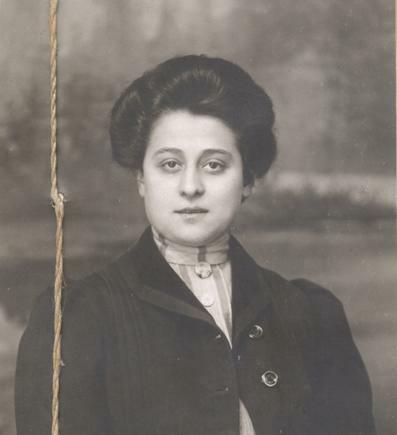 She married Efim (Chaim) Samoilovich Gershenovitch in 1917 and had a son, Samuel Efimovich Gershenovitch on July 1, 1918. Shena went to high school in Warsaw. Click link to see her final report card. She was a Pharmacist in St. Petersburg, Russia in 1917. The couple lived in Moscow where Samuel was born. Shena fell ill and died during the war in the village of Kalinovka in March, 1942. Her son Samuel died in Moscow in August, 2002. Samuel has 2 daughters, Sonya and Natalia, both living in Moscow. Genia was born in 1889. She married Shmuel Katz on 2/27/1911. They had a son,Yudel, born 12/3/1911. as Noar-Kats. 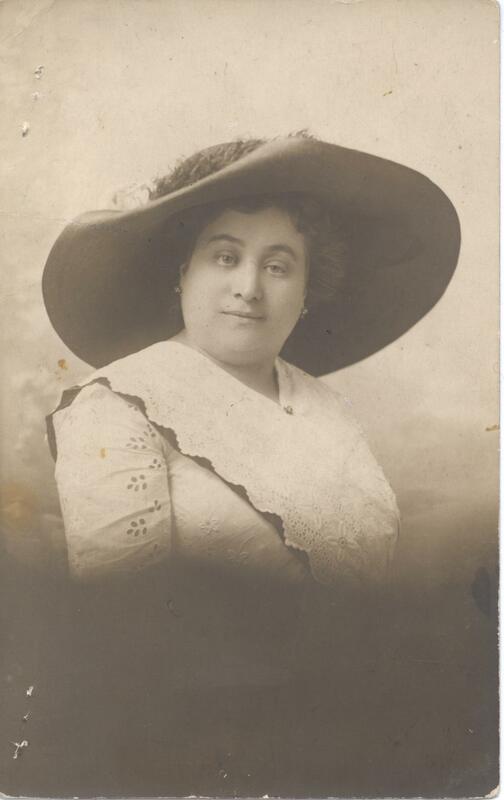 Her business address was given as #26 Blagoveshchenskaya St.
Of his extended family Yudel states, "On family celebrations such as birthdays, Bar Mitzvah ceremonies and marriages all of us assembled to participate in the ceremonies and festivities." "I was born in 1911 in the town Vilna and resided there until it was occupied by the Germans in World War two. 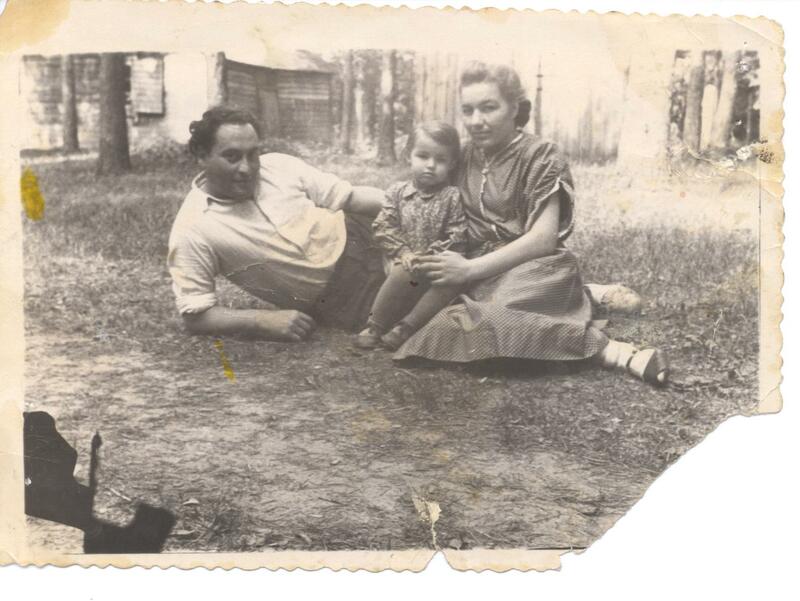 After the occupation I continued living some time in the Ghetto of Vilna until I was caught by the Germans and transported to a concentration camp." 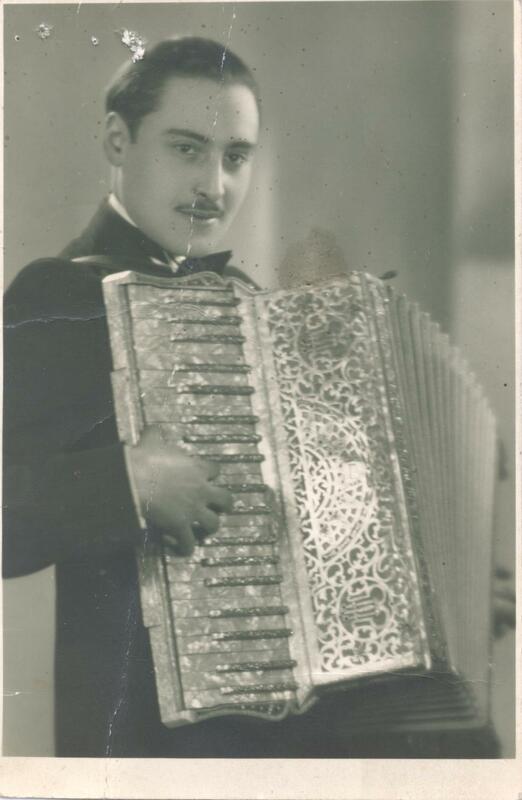 "Upon my release from the concentration camp I made inquiries among the survivors of the remnants of the Jews who resided in the Ghetto of Vilna concerning my parents and relatives there and I found out that all of them were murdered by the Germans." He married and had at least one daughter, as of 1950. In 1959 he immigrated to Israel where he lived in a Malben institution of the Joint Distribution Committee, near Lod. He passed away in 1988. Jews fled in carts, on foot, and even in German army trucks. Notable was the efforts of a German Sergeant major, Anton Schmidt ( a Righteous Gentile) , who ran a mattress workshop and hid many Jewish workmen in basements. He used military trucks to send Jews to Belarus. He was later executed. A group of about 800 Jews from Vilnius sought refuge in Lida. People were trying to survive. The Lida Judenrat got them fake papers to allow them to blend into the background. All of them were betrayed to the Nazis by a few Jews arrested for a robbery & most were killed, including members of the Judenrat."